Product/market fit is complicated for blockchain companies due to the fundamental relationship between decentralized technology and the law. The same was true in the 2000s when people went crazy building p2p file sharing technology. When Napster died, blood was in the water and hungry entrepreneurs flooded the market with decentralized file sharing apps. By mid 2001, Napster was basically dead and Limewire, Kazaa, eDonkey, and BitTorrent were all available for download. If we followed the file sharing market from 2001 to 2006 and treated the companies like traditional early stage software investments, we’d fail to predict that BitTorrent would win the file sharing wars in the end. Some of the most interesting decentralized technologies flirt with the boundary of the law. Privacy coins, prediction markets, censorship-resistant file hosting, and fiat-pegged stable coins are a few examples. These spaces might play out in a similar fashion to the file sharing revolution where companies brushed up against the law. We may want to be cautious about products in these spaces that see strong immediate growth that lead their space in adoption. We should look for the ugly ducklings. How many people are using your product? How much money do you make per user? How fast is your user base growing? Based on similar markets, how many users could you have one day? The most well known companies in Silicon Valley get incredible valuations because their user growth is incredible. If we adjust for the amount of people online in 2000 and how frequently they used the internet, Napster’s user growth may have been even more impressive than Snapchat’s legendary user growth in 2011. When Napster died, decentralized competitors like Kazaa grew at similar breakneck speeds. Comparing Napster’s and Kazaa’s growth to Snapchat is important: breakneck user growth like Snapchat’s is rare. When it happens, investors are more than willing to take a risk on the growth even if profitability isn’t anywhere in sight. The general public likes to hoot and holler at Silicon Valley investors for valuing companies like Snapchat in the billions when they don’t make much money. Not many companies have the daily attention of 190 million people though. When companies have successfully monetized network effects of this scale, it has both created and destroyed some of the biggest businesses in the world. Y Combinator’s advice “make something people want” is well known and compresses a lot of less obvious pieces of advice. When you have a vision for what your product should be, most founders then go all in on building the product and don’t regularly ask their users for feedback. This ties into other advice which focuses a lot on customer service and making people who use your product happy. I could showcase a half dozen other quotes, but the core idea is that startup founders should always be listening to customer needs and then improving the product to service those needs. Breakneck user growth like we saw with Snapchat and Napster are the goal. The core idea behind Y Combinator’s user-obsessed advice is that you’re constantly listening and experimenting with the goal of discovering massive untapped desires that existing companies aren’t servicing. This process isn’t just for executing on totally new ideas like Uber, it is also about finding even better fit by discovering that people actually want UberX and UberPool. In pursuit of growth, the name of the game is constantly honing in untaped desires and doing so better than everyone you’re competing against. Breakneck user growth is the name of the game for software startups and the way to get there is listening to customers and giving them what they want. What did file sharing users want? All the free music and movies they could get their hands on! In 1999, the legality of file sharing was untested and Napster wasn’t really built to be legally resilient. Kazaa, Limewire, eDonkey, BitTorrent, and many other file sharing products were built with the law in mind though. Companies deployed clever uses of cryptography and decentralization in order to protect themselves from the radioactive central search that killed Napster. One of these landing pages is not like the others! Limewire, Kazaa, and eDonkey at least give some signs that the user is in the right place by using keywords like “p2p” and “file sharing.” Limewire shows an example of downloading audio files, eDonkey mentions that users can download mp3s, and Kazaa explicitly mentions “music.” BitTorrent seems intentionally unclear and doesn’t even try to convey that it can be used as an alternative to the other three companies. If you visited BitTorrent’s introduction page, you would be led to believe that BitTorrent isn’t even a consumer product! Wait, I thought my friend said I could get free movies with this? Maybe BitTorrent was making something people want, but if you went to their website in the middle of the p2p file sharing wars you would have no idea. Remember, BitTorrent’s client didn’t have a search bar for discovering content either so downloading the client wouldn’t clear things up. If you visited their FAQ, only two answers even talked about how to find content. They linked to a website for sharing legal concert records and Google. If you wanted to learn how to download music and movies with BitTorrent, you were going to have to go somewhere else. Despite BitTorrent’s actively confusing website, the BitTorrent protocol was actually taking the lead as the most popular file sharing website in 2004 according to an ISP level traffic study. In court, Hollywood would often point to conduct by file sharing services as an indication of bad faith. The Seventh Circuit Court of Appeals latched on to Aimster’s tutorial as an invitation to infringe. A bunch of companies were also called out for having a feature which let users search for “Top 40” songs. Even providing good support was dangerous! The courts pointed to specific emails where staff from file sharing companies seemed to help users infringe on copyrighted content. The Supreme Court decided to judge companies based on if they intentionally tried to attract users interested in copyright infringement. The Supreme Court eventually ruled that each of the companies in the case was clearly going after former Napster users, even pointing to Grokster being named after Napster. As soon as the Supreme Court introduced the concept of “inducement” which killed off the companies built on top of Kazaa’s FastTrack, public policy experts turned to BitTorrent and groaned. Was BitTorrent’s terrible website a good call after all? What about the fact that their download software didn’t have a search bar? I’m sure that both of these decisions really hurt BitTorrent’s adoption from 2001 to 2005 since you couldn’t actually learn how to use BitTorrent by going to their website and you definitely wouldn’t know how to find free music and movies if that is what you wanted. Still, BitTorrent seems to have insulated itself from the issues that killed these other companies. Limewire, Kazaa, eDonkey, and BitTorrent were all launched when Napster finally died, but BitTorrent didn’t start taking the lead until about 6 months before the rest were killed off by the Supreme Court’s ruling. If we rewound to 2001 and watched these companies closely, BitTorrent would seem like the worst of the bunch until the very end. BitTorrent’s adoption was much slower and, judging by their website, they didn’t seem interested in giving users what they wanted in the ways that Limewire, Kazaa, and eDonkey were. The BitTorrent company didn’t know that it would all come down to conduct though. Similar to the crypto space today, no one really knew what was going to happen from a legal perspective. While companies like Kazaa and eDonkey decentralized the search index that killed Napster, BitTorrent outsourced it entirely. An earlier court case against the company “Aimster” may have gone to the Supreme Court if Aimster hadn’t gone bankrupt. Aimster was built on top of the AIM network and applied cryptography in clever ways that made it impossible for them to supervise what was going on within their network. Although these tactics were similar to evasive measures that other file sharing companies took, the Seventh Circuit Court of Appeals ruled this constituted “willful blindness” on Aimster’s part. By comparison, Bram Cohen claimed that BitTorrent‘s design was the exact opposite and made it easy for rights holders to sue infringers. Of course, these use cases aren’t necessarily legal defenses, but it is still noteworthy given that most other file sharing companies did not have similar non-infringing use cases to point to. Someone working at the BitTorrent company probably did a lot of work to make some of these use cases happen. If you visited the “introduction” section on BitTorrent’s website in 2005, you would find an odd essay on free speech and how it relates to the distribution of large files. 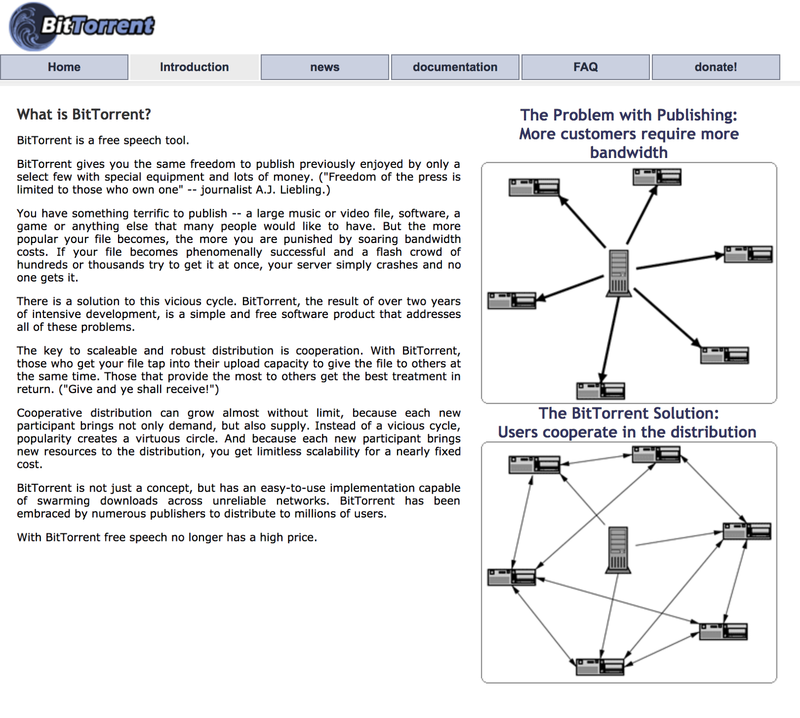 Even if BitTorrent is “free speech”, why is that part of the introduction to BitTorrent? BitTorrent was legitimately harder to use than many of the competitors in 2004. You could just open up Kazaa or eDonkey and search for the content you want. With BitTorrent, you had to download this client and then separately go fetch a .torrent file for it from some third party website. BitTorrent’s website basically stonewalled you with a mixture of missing information and misleading information. If you weren’t watching closely, BitTorrent may have seemed incompetent and the fact that they won the p2p wars might have seemed lucky. If you look closer though, it seems obvious that BitTorrent had a half dozen legal strategies up its sleeve from the start and it really paid off. Of course, their technology was also legitimately innovative and we shouldn’t discount that. Still, Gnutella also had swarming downloads and eDonkey was using distributed hash tables before BitTorrent. Technology mattered, but legal strategy and targeted decentralization killed off the majority of the market in the long run. If we put on our usual venture capitalist hats and looked at the file sharing market in 2001 or 2002, we would have seen Limewire, Kazaa, and eDonkey exploding with Snapchat like popularity. Their websites made it clear that they were tools for sharing music and movies, and their products included useful features like “theaters” which let users listen to music and watch videos while they downloaded. Executives at some file sharing companies even kept tabs on whether popular artists were available for their users. If companies building decentralized technology are flirting with the boundary of the law, maybe immediate breakneck user growth and explicitly giving users what they want is not the best heuristic. Maybe it is better to review the competitors in the space carefully and search for Straussian readings that may reveal which companies are strategically handicapped so that they can survive an eventual legal correction. I’m not talking about any specific company, coin, or token. I’m talking about the spaces. For each of these, we might benefit by asking ourselves “Who is Kazaa? Who is BitTorrent?” If we haven’t seen any sort of legal attention yet, we should be cautious in how we interpret growth if we’re investing in the long run. Weird legal structures and strange public relations decisions might actually be worth analyzing deeply in search of hidden meaning. 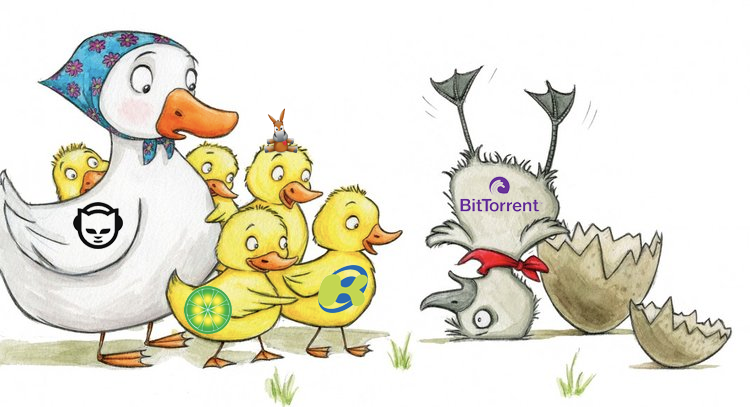 Spotting the ugly duckling may be the name of the game when investing in decentralized technology. If you liked this post, follow me on twitter. I have several other posts about p2p and blockchain and I’ll be writing more.